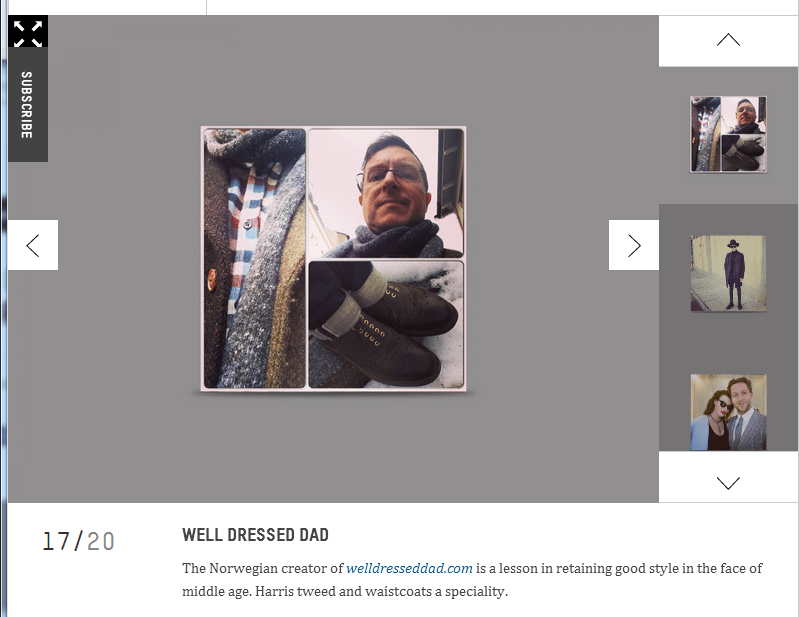 Me, one of the most stylish men on Instagram - Well Dressed Dad - It is a proper menswear blog. Like, with original words and opinions and suchlike. Yesterday brought a very nice surprise by way of Esquire UK. Quite out of the blue they included me in their list of the 20 most stylish men on Instagram! Looking at the other names on the list you can understand why this was so surprising: They are mainly professional players in the field of fashion, menswear and music. Editors, models, photographers, rappers and so forth. And Nick Wooster. It was also nice to see my friend and fellow 40+ blogger Grey Fox receiving the same honour! Thank you to all my new readers and followers, it’s an honour! And thanks to Esquire! Congratulations mate, what a result!